The latest buzz to hit the tinsel town is that Bollywood superstar Shahrukh Khan has evinced interest in the Hindi version of Tollywood movie "Damarukam" starring Nagarjuna. According to sources in Mumbai, Shahrukhan Khan has inquired about the film and was asking about how "Damarukam" was shaping up. And when SRK was briefed about the film's script and contents, the actor was reportedly pleased with the plotline it seems. However, Shahrukh Khan will take a final call on this only after the movie's release. 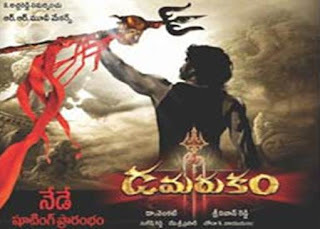 "Damarukam" has almost wrapped up the shooting and is currently undergoing post production works. Anushkha has been roped in as the heroine opposite Nagarjuna and versatile actor Prakash Raj will be seen in an important role. Srinivasa Reddy is directing this film produced by Venkat under RR Movie Makers banner. The socio-fantasy film is expected to release in the second week of July.